If a work space requires individual applications of labels, then Labelmate label dispensers are the ideal choice. With the help of a proven mechanism these devices remove the label from the backing material and present it for further use. For the user this means one work step less, thus increased speed and productivity. Thanks to the broad versatility of the models, paired with their robust, space-saving construction, you use these accessory devices nearly everywhere. Dispensers from Labelmate are designed for labels up to 165 mm wide, and are set up in roughly half a minute. Depending on whether the user wishes to print smaller or larger labels the device adjusts its speed accordingly. For usage in hospitality, the pharmaceutical industry and in other hygienically demanding areas, there are models available made of rust-free steel, which are cleaned just as quickly as they are thoroughly. Additionally, you have your choice of numerous features – including a foot pedal for individual speed control and counters, with which you determine the required amount of labels ahead of time. Labelmate LD-100-RS-SS - Labelmate LD-100-RS-SS, Label dispenser, stainless steel, max. label width: 115 mm, label length: 6 to 150 mm, speed: 11 cm/sec. Labelmate LD-200-RS - Labelmate LD-200-RS, Label dispenser, max. 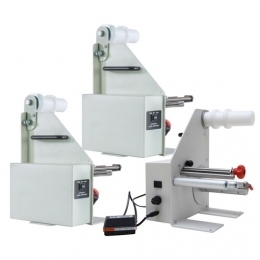 label width: 165 mm, label length: 6 to 150 mm, speed: 11 cm/sec.